Concrete planters are the perfect container for displaying outdoor tropical palms and shrubs. 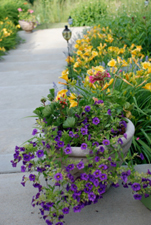 They are low-maintenance and complement porches, patios, driveways, and entranceways. Unique patterns and styles add interest and elegance to your landscape or garden design. Concrete Plant Containers – What Are The Advantages? Heavy duty outdoor containers protect plants from extreme temperatures. Their large weight and size discourage theft of valuable tropicals. Ideal home for large outdoor plants, shrubs, and trees with large root systems. They are available in larger sizes than other conatiners. Fiberglass planters made to look like concrete are a light weight option ideal for terraces and decks. Resin is mixed with polystone to create the look and feel of concrete without the weight. Concrete plant containers are ideal if you are looking for strength and stability for large outdoor tropicals. Take a little extra time when choosing this type of plant container because you will more than likely replace it due to making a bad choice, not because of wear and tear. Decide what the planter will hold. Choose a container that will accommodate the roots of the tropical tree, shrub, or plant when it reaches maturity. If you need the ability to move the pot for any reason, think twice about buying a genuine concrete planter. Remember, faux planters with the look and feel of concrete are a lightweight alternative. Choose a color and/or texture that complements you landscape as well as the architectural style of your home. Cast stone planters are available in a variety of colors and textures. If you cannot find a pre-made planter that fits your needs, you can have one custom-made to your specifications. Caring for planters properly will keep plants healthy and ensure the container is structurally sound. Concrete plant containers are durable and require minimal care. Concrete is porous and may need to be sealed. Watering plants in freezing temperatures can cause cast stone containers to crack if the water freezes. Be sure to allow for adequate drainage or move the planter to a location (such as the garage) that will protect the planter from freezing temperatures.